When: Held the last Wednesday in August (in 2013: 28 Aug). What: The tomato growing season for this Spanish town, 40 kilometres from Valencia, always ends on the last Wednesday in August. What happens next is the local population is joined by tens of thousands of visitors for the cultural celebration of La Tomatina. Then: Rumor has it La Tomatina started over a ‘you say tomah-to, I say tomay-to’ dispute, but more reliable sources tell us that the tomato throwing is in honor of the patron saints of the town, and that it started in the 1940s. Though its exact origins remain a mystery, the tradition caught on (and except during a ban during the Franco period) it has grown bigger every year. Now: These days, Buñol, a town of 9000 swells to up to 40,000 during the La Tomatina week. The main event aside, other activities include parades, dances, music, fireworks and a paella making competition. 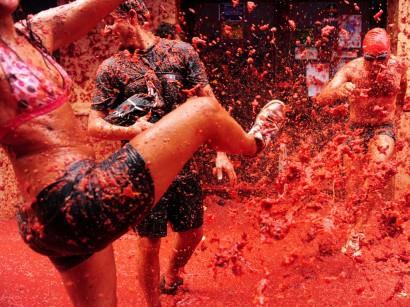 The tomato fight takes place on the Wednesday, starting at around 10am. In theory, the proceedings will officially begin when one person has successfully scaled a tall greasy pole and reached the leg of ham that has been placed on top. In reality, the combined unlikelihood of achieving this task and the eagerness of the punters means the tomatoes get thrown early. For exactly one hour the city is a pulpy, tomato flavoured battleground and it’s every person for themselves. 125,000 kilograms of ripe fruit is trucked into the town and chaos ensues. The key is to wear clothes you won’t miss as even if you manage to escape the river of red (which you won’t), shirt ripping is also not unheard of (and practically a given if you are a bloke). After the appointed time, the water cannons are switched on and the cleanup process begins. As luck has it, the town in sat on a river so most throwers will head there for a wash. Tomato soup for lunch? Get there: The nearest airport to Buñol is at the sunny seaside city of Valencia, which is well serviced by Easyjet, Ryanair, Clickair and Iberia. Many also choose to arrive by coach. Stay there: Because of the limited accommodation options, many festival goers choose to stay in nearby Valencia and bus or train it in for the day. Buñol is about 38km from Valencia. Naturally, the region gets packed out so plan ahead or opt for a package tour.